Happy almost Easter, everyone! I hope all of you are enjoying time with family and friends. I know I am. My family is in town from Pennsylvania this weekend. We’ve been enjoying each others company since they arrived on Friday. Yesterday, my Aunt watched me cook and we chatted about the goings on in our lives. Last night we had a bonfire at my mom’s house- a lot of junk food was consumed and a few of these cocojitos. Today, we’re going to grill some food and enjoy some family fun time. We may even bust out some board games. I made iced green tea yesterday. This tea is my mom’s favorite. I came up with recipe while I was piddling around in the kitchen one day- I piddle a lot. I use Tazo Zen green tea bags in this recipe. 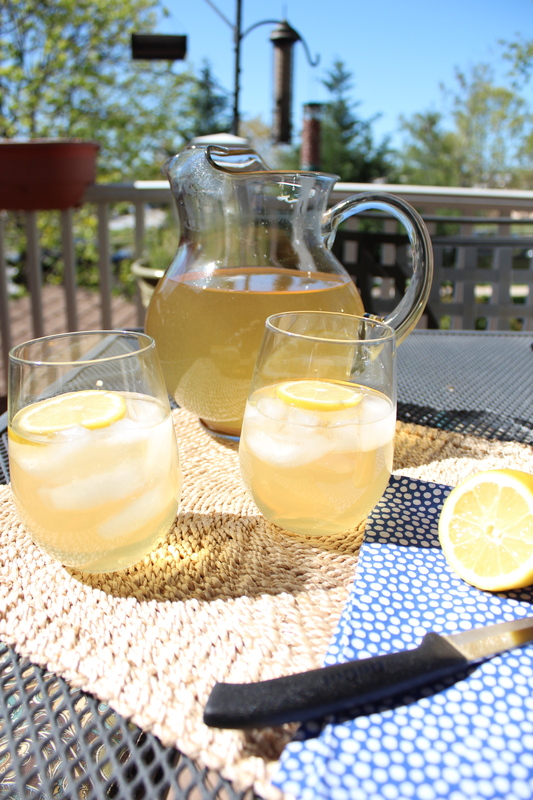 The combination of lemongrass and spearmint create a lovely, refreshing iced tea. I use honey to sweeten this tea instead of sugar. 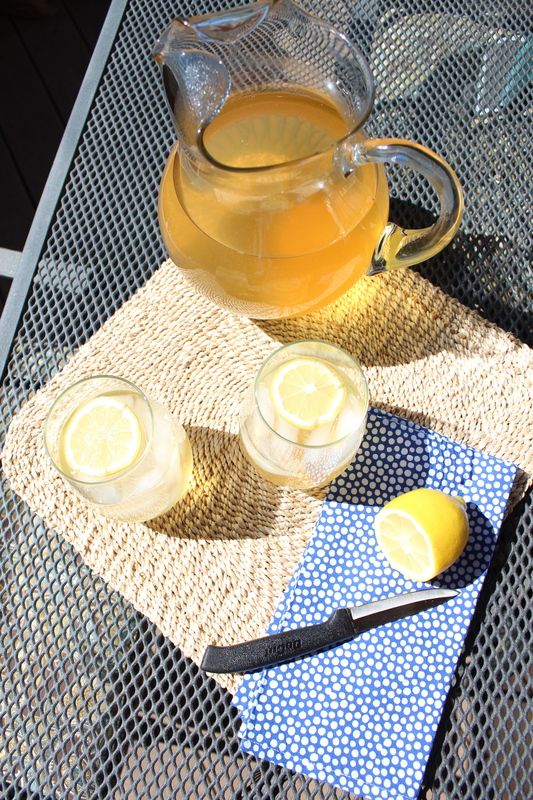 The honey pairs perfectly with the lemongrass and spearmint notes in the tea. A squeeze of lemon brightens the tea. 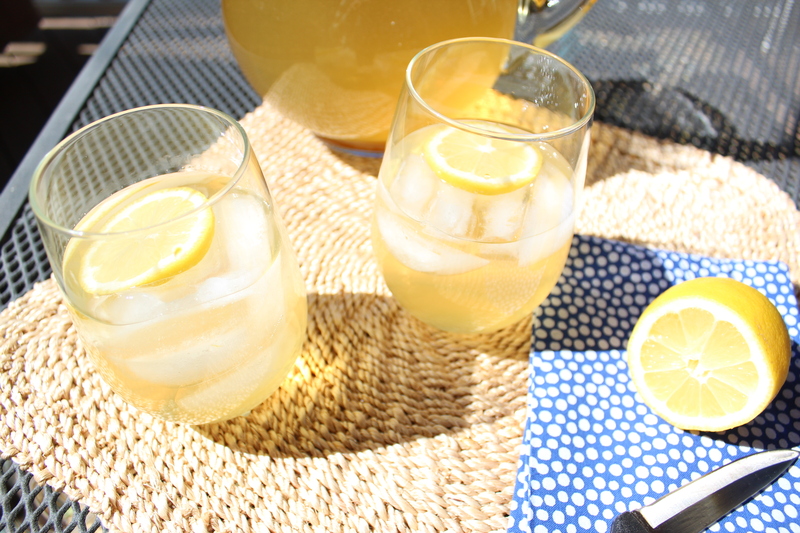 Add a generous amount of ice to a glass and a lemon slice, and you have the perfect drink for porch sippin’. My Aunt and I enjoyed this tea out on my deck yesterday while listening to 80’s music (my fav) and reading food magazines. Bring 11 cups of water to a boil. Take the water off the heat and add the tea bags. Steep for 3 minutes, no longer (any longer and the tea will become bitter). Add honey and the juice of one lemon, stir. If you like your tea a little sweeter, feel free to add more honey. Transfer the mixture to a heat proof pitcher and refrigerate until cool. Pour over ice and add a slice of lemon. Enjoy. So refreshing. This would be perfect for today! And I love honey in my tea! Thanks, Jen. If you make it, let me know what you think. I like to take a few bags of green tea and a few bags or tablespoons of mint tea and combine them, then chill and serve as iced tea. That sounds delicious. What a good idea. I have mint tea, so I am going to try that. Thanks! Mmm! I love green tea and this looks so good. Beautiful photos! Thanks so much. I hope you enjoy the tea if you try it. You’re welcome. It is such a refreshing drink. Enjoy!